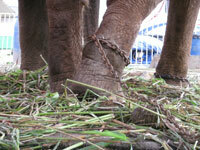 ADI remains very active in Brazil, where national legislation to ban animal circuses is advancing. We also continue with the local bans and public awareness work. January 2014: Minas Gerais, one of the most important states of Brazil, has become the tenth Brazilian state to ban the use of animals in circuses. The Governor has enacted the Law 21,159 of 2014. Thank you to “Movimento Mineiro pelos Direitos Animais” for their perseverance and everyone who urged the deputies to pass, and the governor to sanction, the ban. ADI Latin America provided support and advice to help secure this important victory. January 2014: The ban on animal circuses in Minas Gerais is stalling, as it is still waiting to be sanctioned by the governor. Please take action! Urge governor Antonio Anastasia to sanction law PL 4787/2013 as soon as possible – contact him via facebook, tweet @governomg and post a message via the state government website. ADI will be participating once again in this annual event on September 22nd - at which there will be presentations, music/entertainment and vegan food - and will be giving a talk about our campaign to end the use of animals in circuses in Brazil. On the 10th November 2010 a request for an emergency vote of Bill 7291 – 2006 aimed at banning all animals in circuses in Brazil was signed. This request has changed the legislative procedure for this bill, from a “priority” procedure to an “emergency” procedure, which will effectively speed up the ban. A new video documentary from Animal Defenders International (ADI) “Unnatural Acts. Stopping the suffering in circuses in Brasil," is being screened in the House of Representatives with a call for Congress to adopt Bill 7291/2006 banning animal circuses throughout Brasil. ADI welcomes progress of Bill No. 7291/2006, which has been passed by the Constitution, Justice and Citizenship in the House of Representatives. New ADI report reviews the scientific evidence on the effects of transport and captivity on animals that confirms their welfare is compromised – and this is the case for both domesticated and non-domesticated species. Disturbing new photographs of animals in South American circuses contrast with animals in their natural environment. Photo gallery of how animals live inside a Brazilian circus.